condensate pans and drains, inadequate humidity control or holes in coils. Most species of moulds only need a relative humidity of 70% to start growing, some species even less. 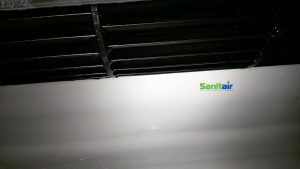 One of the largest contributing factors to amplified mould growth in air conditioning systems is due to fluctuations in temperature and humidity. These constantly trigger mould life cycles. 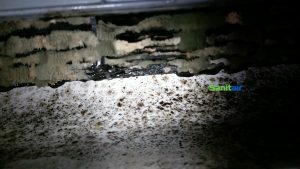 Many species of mould growth in airconditioning systems are known to have a negative impact and even toxic affect on human health. Although mould growth needs to be significant to impact a person’s health, asthma and allergy sufferers may be seriously affected by exposure to minor amounts of microbial growth. In hospitals or in places where people are very sick or have compromised immune systems, the presence of microbial contamination can cause serious infections and even death. Exposure to microbial contamination can also bring about allergic reactions. These generally subside when a person has left the contaminated area. mould, however, to the untrained eye, visible mould growth can easily be mistaken for general dust and debris. Mould can be found growing on all types of surfaces including plastic, aluminium and stainless steel, painted surfaces, insulation and filters. Undertaking activities that disturb mould, particularly washing mouldy coils, can cause an increase in airborne microbial contamination. This can pose risk to a person’s health and cause problems for the HVAC system. 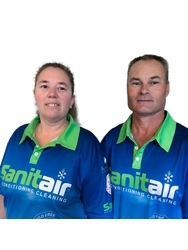 Sanitair are qualified in Air Conditioning Mould Remediation, 1800 130 168 for you local licensed Sanitair technician.